Though it might be hard to believe, we’re already at Carmelo Anthony’s 10th signature shoe for Jordan Brand. His models have generally been good on-court options, especially the M8 and M9, even if they haven’t been as commercially successful as other athletes’ signature shoes. The M10 borrows heavily from the Jordan XX8 SE, using the same tooling underfoot and Dynamic Fit lacing system. Where it differs, however, is in the materials used throughout the upper and that’s something that ultimately sets it apart from many shoes on the market right now. The M10 has a slightly wider forefoot than the average shoe, but I didn’t feel any slipping or lack of containment, and the same can be said for the midfoot. The Dynamic Fit system combined with the carbon fiber shank underneath makes for a secure midfoot. Dynamic Fit, if you’ve read our prior review on the XX8 SE, is basically a combination of straps that tie directly to the midsole. When laced up, these straps wrap the foot and provide excellent lockdown. Heel lockdown is a premium feature in this model as well. There are two Achilles’ notches in the interior of each shoe that really help your foot stay in place. A major difference between the M10 and XX8 SE (besides the slightly higher cut of the M10) is that the M10 uses heavy-duty synthetics for the upper. Despite this, the flexibility is definitely above average. Your foot really isn’t hindered at all and carbon fiber shank keeps excessive torque off your foot. However, this personally wasn’t adequate for me. I need a shoe with a little more rigidity, but overall I liked the flexibility. The overall fit is better and more secure than most. The synthetic leather is premium and feels excellent on foot. I’d recommend going a half size down as these run big for me, but try to try a pair on first because no two feet are exactly the same. Heel to toe transition is probably the best I’ve experienced in a sneaker. The optimal flexibility and decoupled heel and forefoot (the heel and forefoot are two independent pieces) make for a seamless ride. 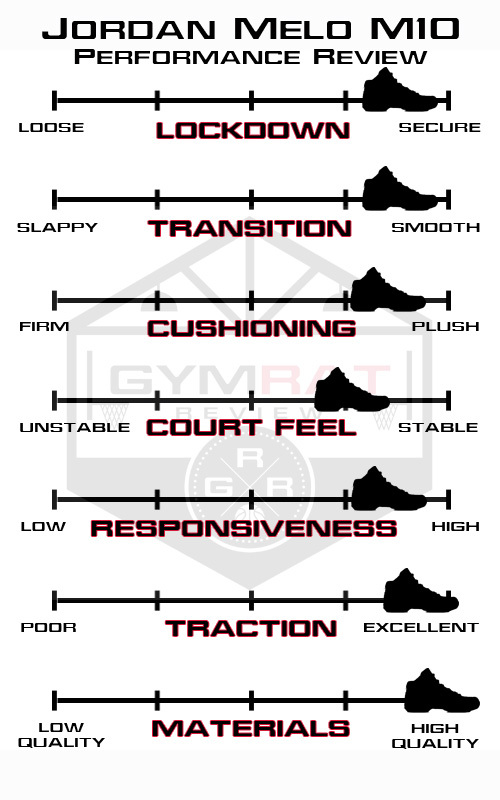 Sometimes a decoupled midsole (like the KD V Elite for example) can make for a slappy and inconsistent gait, but the combination of the Flight Plate, Zoom bag setup, and softer outsole allow for near perfect transition. Cushioning was absolutely great. The unlocked Zoom in the forefoot was pretty sweet and I loved hooping in them. Heel cushioning is also very good. 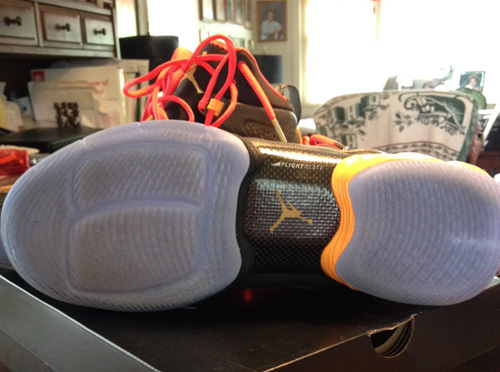 As with the XX8 SE, this is probably the best cushioning setup on the market. Court feel and stability are pretty good as well. I had zero issues with stability and the court feel was quite good also. Again, you’ll occasionally find a decoupled midsole to be a bit unstable, but the midsole is so well-engineered that you shouldn’t have any issues here. Arch support is definitely lacking in this shoe in that the midfoot of the shoe doesn’t necessarily hit your arch, but it wasn’t a deal breaker for me. The carbon fiber plate should give you enough rigidity and support. The M10 is one of the best on the market in terms of responsiveness. After playing in a Flight Plate-based shoe with the unlocked Zoom bag, normal Zoom setups will not feel the same. Bottom line, the cushioning setup featuring the large, cored out Zoom and Flight Plate is hands down one of the best on the market – whether it’s the XX8, XX8 SE, or M10. Best traction I’ve used short of the Kobe 9 Elite (review coming soon). You shouldn’t have issues even on dusty courts. Lace ‘em up and you’re good to go. Like I said before, materials are premium. The M10 features some of the highest quality synthetics on the market, and Jordan Brand should be commended for packing quality materials into its athletes’ sigs. The CP3.VII and M10 both rate very highly in the materials department. It’s simply a very comfortable sneaker too. I loved the synthetic leather and the neoprene inner booty. From the sole and up, I loved the comfort. The M10 doesn’t have any real signs of wear and tear, but be aware that synthetic leather will scuff so be prepared for some if you hoop in these regularly. Because of the quality of materials, this a good long term option. They should last a while and be a solid performer. *Sidenote: Some people (including Sittler) have experienced the Zoom bag popping in this type of cushioning setup, but I personally did not. Nike has a great program for defective shoes so your purchase will be protected regardless of where you purchased them if your Zoom bag does blow out. If you’re looking for premium materials, cushioning, and fit, look no further than the M10. It’s without a doubt one of the top shoes we’ve tested at TGRR this year. You guys double typed a sentence up when you were talking about arch support. Also, other reviewers stated that the unlocked zoom bag in the m10 felt much more firm than the one in the 28/28se. Did you notice any major difference because I’m leaning toward the m10 but a less responsive zoom bag might shift me towards the 28se. 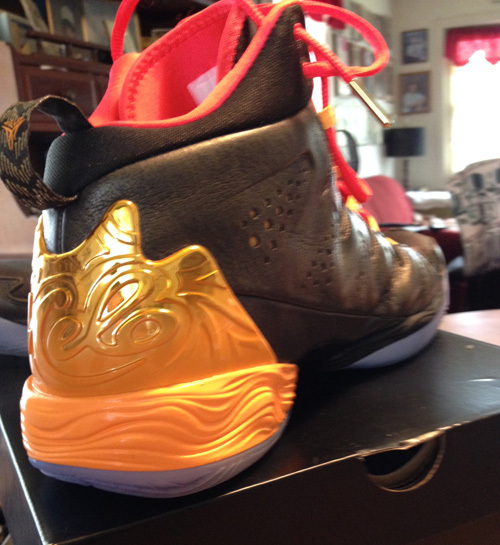 I’ll see if Max has played in both – I’ve played in the XX8 SE only and he did the Melo M10 review. I’m not sure if the midsole foam is different between the models – from the limited specs I can find I think the XX8 SE is Phylon, perhaps the M10 is a denser material. I have read too that the M10 is firm but no less responsive, and really if you want responsiveness a firm bag is probably better than a mushy one that gives too much on impact. To be honest, both shoes are going to be great either way. The cushioning difference is probably going to be unnoticeable unless you’re really trying to find an issue with one of em. I’d say your decision between the two should come down to whether you want to go with a slightly more flexible upper of the XX8 SE or the thicker, leather based upper (with a higher cut at the collar) of the M10. 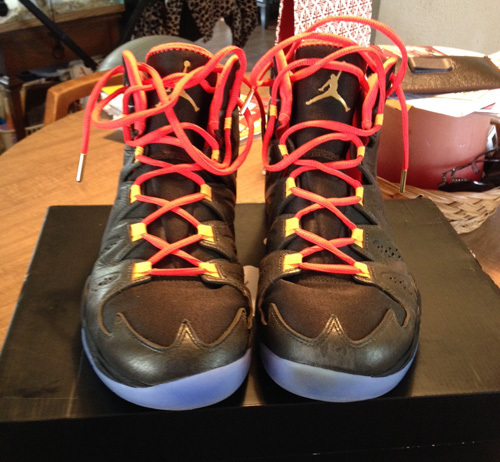 i’ve only played in the melo 10s but a buddy of mine has the SE. Id say the midsole of the SE is less dense but I doubt you’d really notice all too much. 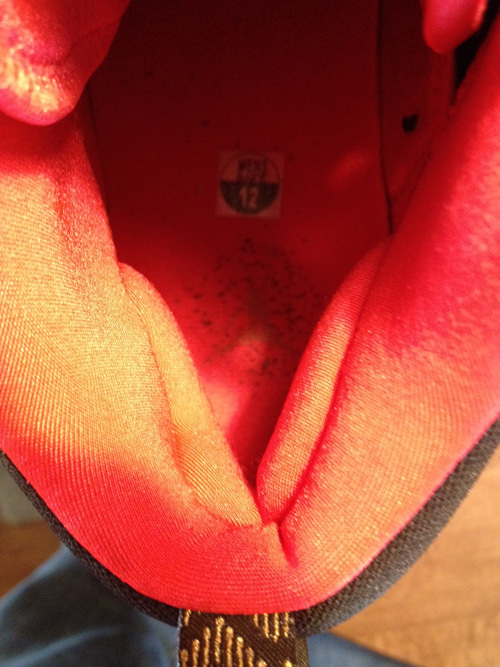 Also durability issues tend to plague the SE much more so than the Melos. My friends pair popped in both forefoot and heel and the carbon fiber on the heel separated badly. i’ve only worn my M10s twice now and already the unlocked zoom popped in the forefoot, the same thing happend with my previous show the Jordan Superfly 2. Both the shoes still had the fresh new sneaker smell too.